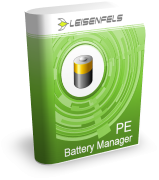 The Battery Manager Personal Edition (PE) is the smallest and cost-effective solution for all users searching for a convenient tool to manage batteries and charging devices and do not need functions like external server databases or network connections. The embedded database requires zero administration, the initial configuration may be done using convenient wizards identifying connected devices and preparing the database quickly. Do you like to evaluate Battery Manager first? Then the Personal Edition is the right choice, after the installation on your PC you can start right away. The embedded database shipped with Battery Manager requires zero administration, the initial configuration may be done using convenient wizards identifying connected devices and preparing the database quickly. You will find commonly used battery types and manufacturers pre-installed after the installation. If you like to work with multiple users in Battery Manager upgrading to the Professional Edition (single-client, multi-user) or the Enterprise Edition (multi-client, multi-user) is possible at any time. The datasets from the embedded database can be transferred into external databases like Oracle or MySQL. You can create backups on a regular basis directly from the running application to be restored later.